Alpha Kappa Alpha Sorority, Inc. (AKA), the oldest Greek-letter organization established for African American women, was founded on January 15, 1908, on the campus of Howard University in Washington, D.C. The principles are Sisterhood, Scholarship, and Service to All Humankind. This organization was founded on two key themes. The first is the importance of the individual. The second is the strength of an organization of women of ability and courage. 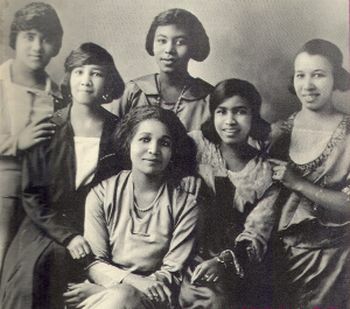 The sorority formed to serve an African American community that faced the growing challenge of racial discrimination and injustice in the early 20th Century United States. Alpha Kappa Alpha Sorority has over 200,000 members in over 950 chapters located in the United States, Caribbean, Germany, Korea, and Japan. Graduate members make up the largest percent of membership at 77%. Undergraduate membership follows at 13%. Its members continue to uphold the same scholastic achievements as its founders; 63% if its members have a bachelor’s degree, 57% have a master’s degree, 9% have a doctorate degree, and 7% have professional certifications. The members of Alpha Kappa Sorority come from diverse backgrounds and are known for a variety of contributions. Maya Angelou is a world-famous poet, author, and filmmaker. Alicia Keys is a Grammy award winning singer, songwriter, and musician. Coretta Scott King was the wife of Martin Luther King, the most prominent 20th Century civil rights activist. Rosa Parks is generally considered the mother of the civil rights movement. Most recently, Michelle Obama, an honorary member, has become first African American First Lady in US history. These and other AKA women have built national programs on the foundation of family and community. The Extraordinary Service Program (ESP) is their most important community effort. ESP is in fact five programs that address issues in African American communities. The Nontraditional Entrepreneur program provides training and networking opportunities for small business owners. The Economic Keys to Success Program provides family training in financial literacy. The Economic Growth for the Black Family program works with vulnerable young black males. Economic Educational Advancement Through Technology provides training to individuals and community organizations in high tech fields. Finally, the Health Resource Management and Economics program focuses on the health crisis facing the African American community. Through these programs Alpha Kappa Alpha Sorority assists with the most crucial needs of the black community. Sources: Daniel Soyer, "Fraternities and Sororities," Encyclopedia of African-American Culture and History (New York: Macmillan Library Reference, 1996); Alpha Kappa Alpha Sorority, Incorporated, 2009, http://www.aka1908.com/events/.